This morning’s snow imparted a decidedly wintry feeling to the day, but yesterday’s sun and mild temperatures seemed to me a foretelling of a foretelling of spring. Yesterday’s air had none of the scent of spring, but from the sunny vantage of yesterday afternoon … I sensed for the first time this year that spring’s first revelations would not be far off. 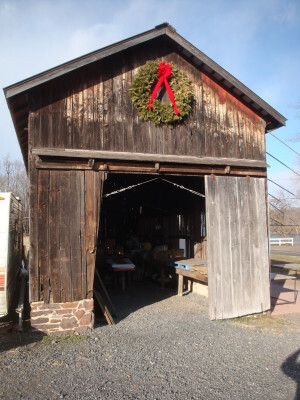 The days lengthen as we leave the winter solstice behind us, and we are now less than a month from our first seeding date in the greenhouse. Whether the weather warms soon or not … to your farmers, it feels like springtime is coming on fast! 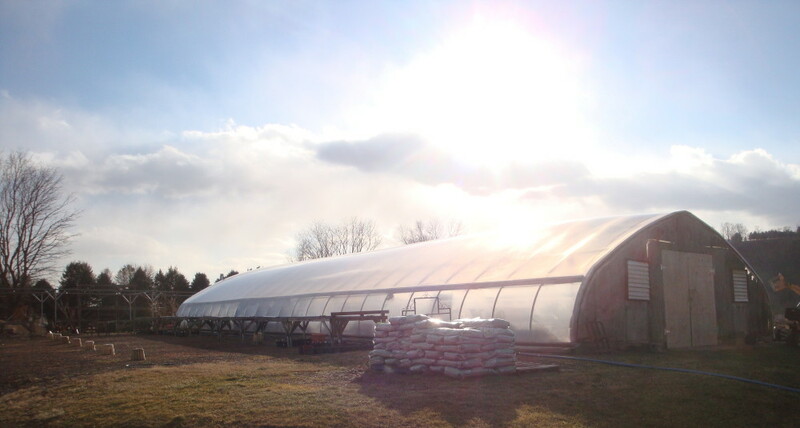 We’re moving out of winter hibernation mode and getting excited about the coming 2015 growing season. We placed our seed order at the end of January, sent some printing projects to the press at the end of last week, and soon we’ll begin working outdoors on this year’s construction & infrastructure projects. We want to let you know about some improvement projects that we’re looking forward to in the coming season. Each spring before the demands of weeding and harvesting eclipse all else, we try to undertake a couple projects that will provide a lasting improvement to our enterprise. Last year, we rebuilt the north endwall of the greenhouse and installed more powerful motors to drive the greenhouse fans. We also bought a new drop spreader so that we no longer have to apply our main granular fertilizer by hand. Seed garlic is an interesting market, and seed cloves aren’t cheap. We spent about $1,000 on 100 lbs. The bulbs that showed up were quite large, and we’re excited to see if we’re able to grow this year’s bulbs as large as their parents. To that end, we also embarked on an educational project. 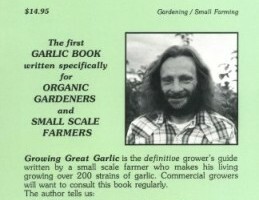 Farmer John purchased himself a copy of a classic tome on garlic cultivation — Growing Great Garlic by Ron Engeland. We would be doing you a disservice if we failed to share with you an image of the back cover of the book (to the right). We read up on our garlic techniques and concluded that we should try mulching our garlic for the first time. So, as I write, the new garlic is out on the north end of our fields, nestled into the earth under a cover of hay mulch and snow. 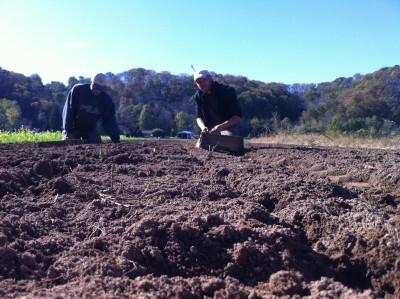 We have high hopes for its spring emergence from the hay and for a better garlic yield this year. Between the corn crib and the cooler, you might notice 2015 Farm Improvement Project #3 as you walk out toward the flower patch. 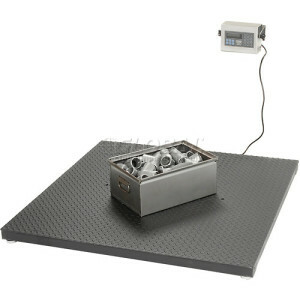 Early this spring, we’ll be installing a pallet-sized “floor” scale next to our wash station. (The scale itself will look something like the one on the right.) I put “floor” in quotes because, in our case, the scale will be installed in a wooden frame that we’ll dig into the ground. This one is a much-anticipated upgrade for your farmers for two reasons. For one, the pallet-sized scale will allow us to easily weigh entire bulk bins full of melons or winter squash. When we bring a bin of melons in from the field, we’ll be able to use the pallet forks on the tractor to set the bin down directly on the scale. We can record the weight and then fork the bin up again to position it for distribution. No need to estimate weights or unload a whole bin in order to get a precise measurement. Moreover, the new scale should save us from some awkward lifting inside our cooler-trailer. Our current scale sits inside the cooler-trailer, between the farmstand’s ice machine and the door of the cooler. This definitely works, but it requires a great deal of lifting and twisting in a confined space. Our lower backs are excited about weighing everything at the wash station and then trotting straight up the ramp and into the cooler. All in all, we’re looking forward to another great year, and we have a lot to be excited about! As the sun climbs a little higher in the sky each day, our bodies stir out of their deep wintertime recharge cycle, and the upwelling energy of the coming Spring urges us to get outdoors again. We look forward to seeing you all again soon, and we’re looking forward Season 3!